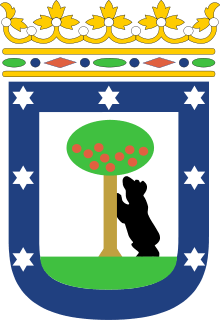 For other uses, see Chamartín. It is bounded by the Paseo de la Castellana to the west, the Autopista de Circunvalación M-30 to the north and east, and the Autovía A-2 to the south. Some of the landmarks of Chamartin are the Gate of Europe, a pair of inclined office buildings; the Santiago Bernabéu Stadium, home of the football team Real Madrid; Chamartín Station, the second largest train station in Madrid; the Cuatro Torres Business Area, a business park that comprises the four tallest skyscrapers in Spain; and the National Auditorium of Music (the main concert hall in Madrid) which hosts the Spanish National Orchestra. 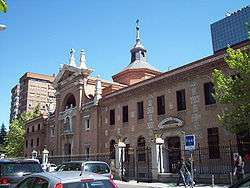 The district has the head office of Iberia Airlines and the head office of Iberia Express. ↑ "Legal notice." Iberia. Retrieved on 25 February 2010. "IBERIA, Líneas Aéreas de España, S.A. with official address at Calle Velázquez no. 130, 28006 Madrid,"
↑ "Información Legal y Protección de Datos." Iberia Express. Retrieved on 15 March 2012. "Compañía Operadora de Corto y Medio Radio Iberia Express, S.A. con domicilio social en la calle Velázquez nº 130, 28006 Madrid"